​How glorious it is to wake up to the full song of birds chatting to each other like neighboring friends as they park in holding patterns for their turn at the bird feeders. Nature's orchestra winding up to its Grieg ordered celebration of another glorious morning with a descant by selected chipmunks and red squirrels. It is the consummate affirmation of life. 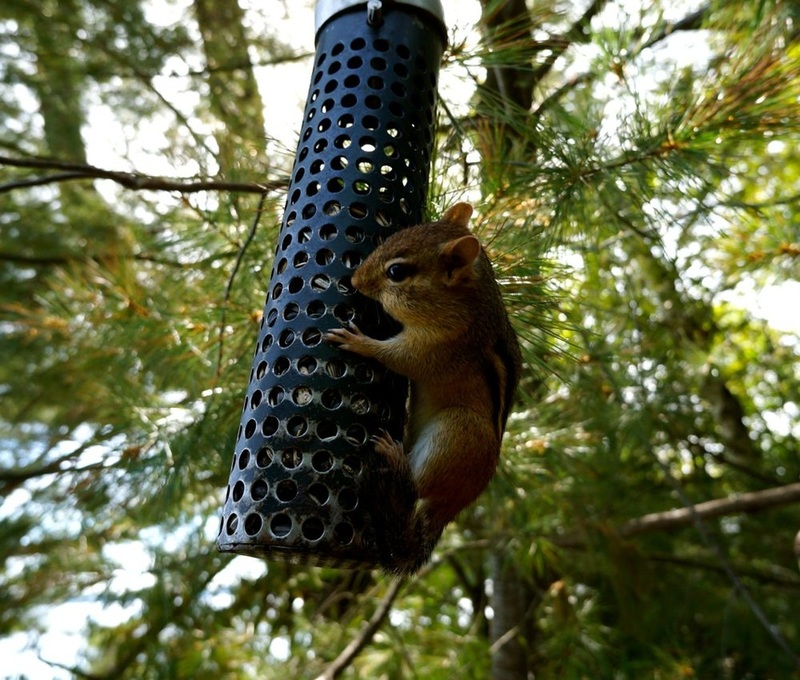 ​It has been many years now since we set out our bird feeders at the cottage in our forested retreat. The birds told us which styles they approved of and lesser models were scrapped. We now have a full row, but they seem not to be enough. The birds still wait in line in the spring when they are especially hungry waiting for the next round of natures post-winter bounty. We have all colours from gold and purple finches to blue jays, chickadees and sparrows. Occasionally, the black crows come and make a raucus explosion but they struggle with the feeders and soon depart. Even Sap Suckers get in line when the pickings look easy. 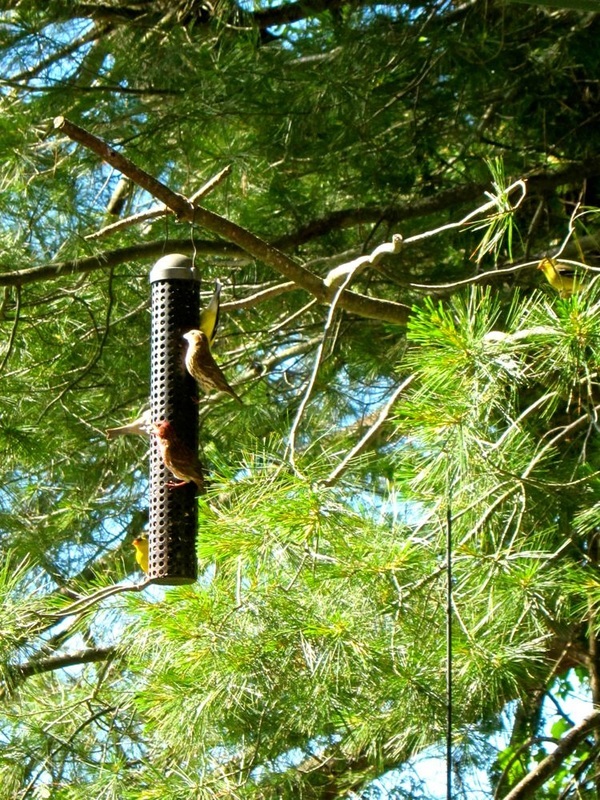 The wood peckers try to hammer the feeders into submission, providing the tympany in the orchestra. ​I sometimes want to record their singing so we can have it as a memory cue in the winter, but maybe not. Let each season stand on its own. In Spring and summer, it is the perfect light symphony to accompany a morning coffee on the deck as we look out at the sparkled lake and the fleet of mamma and the 8 ducklings taking early dive lessons. During the day, the birds' songs are often drowned out by the lake users with wretched boats as well as loud voices carried and amplified by the water. But in the early morning, only the arias of the magnificent avian opera fill the air. There are days when we have to bring in our feeders to keep them from the destruction at the hands of the foraging raccoons. When our feeders are empty or beyond reach, the disappointed raccoons will destroy some of the flower pots or poo on the plants just to remind us that they too need some food. But one can't feed the whole world and the raccoons have more options. What concerns me a bit though is seeing these birds getting chubby as summer unfolds and many of the lake residents put out feeders. Only the humming birds stay slim while some of the goldfinches struggle to get airborne. Do we just make them dependent on us and leave them unable to forage on their own once we leave the cottage country in the Fall. Most birds join in the annual southward migration but our friends who winter at their cottage, assure us there are other sets of birds from further north down. These tough little guys have not seen humans and with no bad experiences seem very tame, flying to their hands as they refill the feeders. Our gang of singers seem to have us on their wake-up schedule and then flip over to other feeders for brunch to make sure all their humans are happy and keep refilling the feeders. When the opera moves on, our world seems flat. But next morning, the entire symphony reappears. ​While there are joys in feeding these wonderful songbirds, there are also challenges. 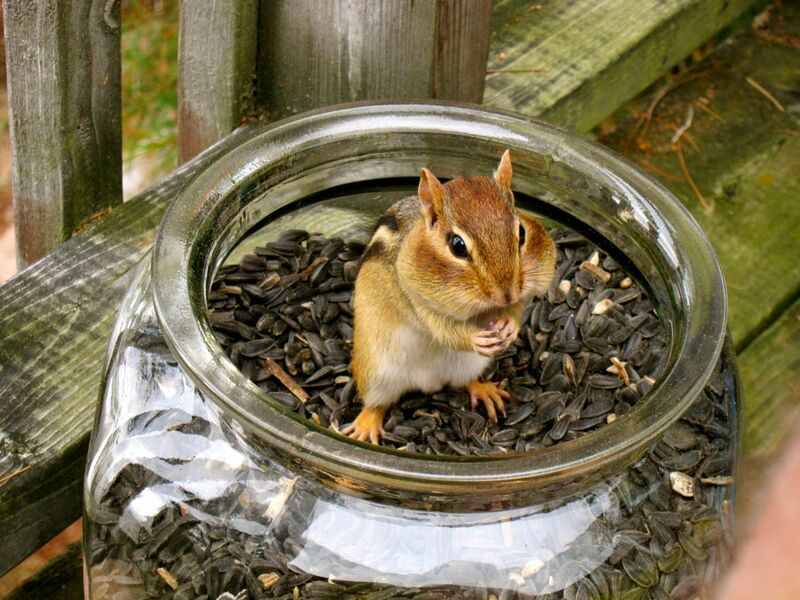 For one, we do share the feeders with squirrels and chipmunks. Then, these feeders attract the raccoons at night and bringing the feeders indoors attracts mice. The balancing act has kept us busy for years and the mouse wars have become legendary. Even a hint of bird seed and they invade. The little beggars are as clever as we are and much hungrier so nothing can stop the forage. We have other concerns during the day. That is their only concern. But it keeps us designing new anti mouse strategies and plotting viscious revenge. I sometimes think I hear the little wretches giggling behind the walls! ​We used different kinds of feed in hot competition with the neighbors to increase numbers and varieties. We have invested in Niger seed for the finches and watched our investment dropping down on the ground as the squirrels and raccoons bash away at the feeders. 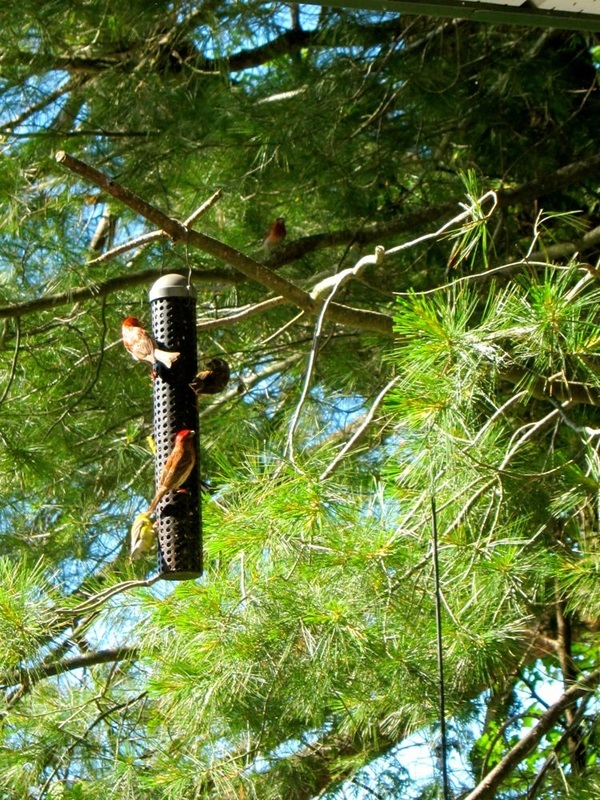 Secret mixes for the Hummers are countered by more elaborate feeders displayed by the folks next door. Eventually, we saw that most of the birds (except Hummers) like sunflower seeds anyway so we just stick to these. We have now big glass jars to hold the seeds inside the cottage earning the rich hatred of Team Mouse. 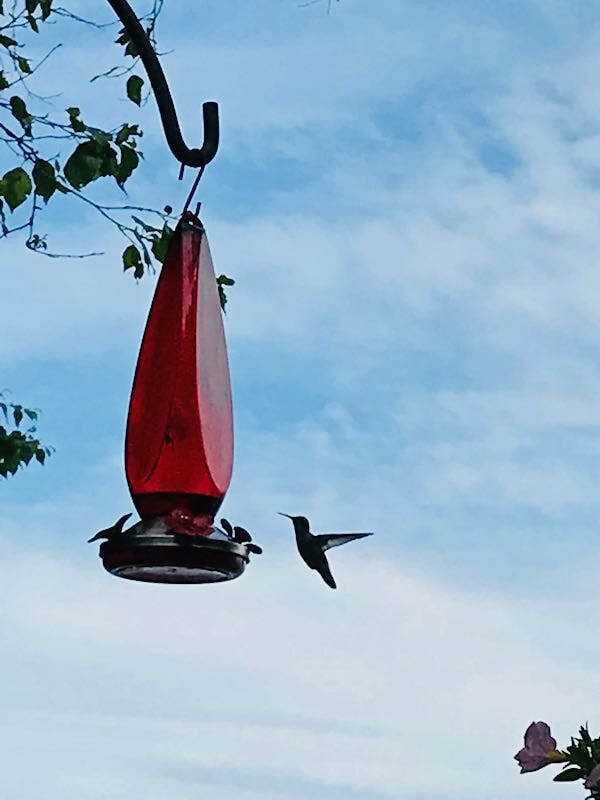 The Hummingbirds are a major fixture in our bird feeding. Four parts water and one part sugar and the hummies are very happy. There are always hummie wars going on around our feeder. ​Watching these hummies zoom through can be entertaining but, at times, also disconcerting. Once the flowers are in full bloom, these hummies enjoy feeding on them. Every year, we try to plants flowers that attract hummingbirds as they are often a joy to watch. 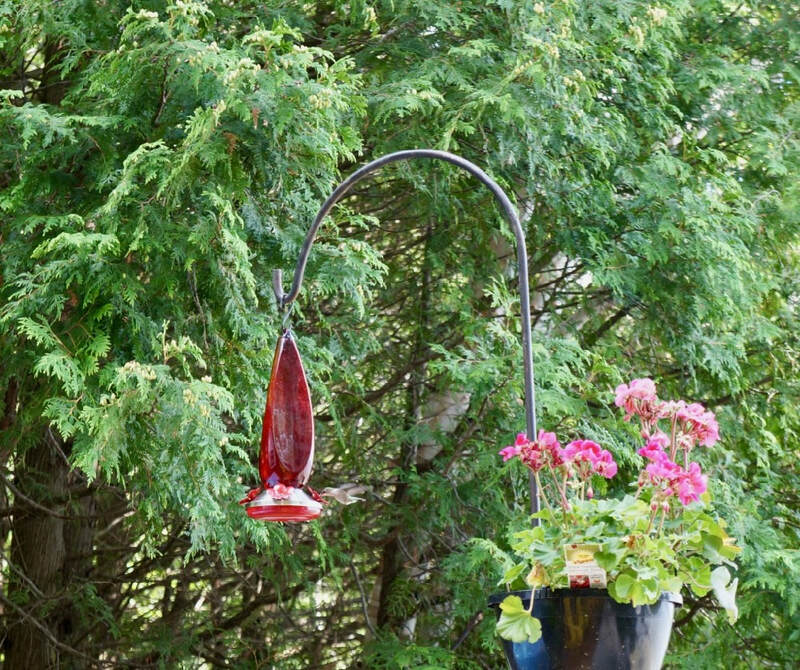 ​​When we remember, we bring in the hummingbird bird feeder to protect it from the raccoons. The raccoons, when they find this out, often leave us with some unpleasant presents. ​However, the big sacks often have to be stored and we have tried putting them in our big Chinese pot covered with glass with pots on top. But the raccoons somehow smell or may have watched us place the feed in here as they have moved the top weights and hovered the seed without breaking the glass on top. We have accepted that the raccoons are smarter than we are, so we buy smaller quantities of seed. Our success has been marked by hillocks of angry raccoon poo marking the deck each morning. Beating the raccoons, squirrels, the occasional bear and our neighbors in the bird wars keeps us very busy, but the morning symphony is well worth the struggle. We firmly believe that we have won the battle for breakfast and are holding the evil monster raccoons and mice at bay. It is now spring, and we are planning our assault for bird battles. We heard of a new aggression by the neighbours on our morning mastery and we are designing a lunch menu attack that will empty their feeders at noon hour. ​The birds now have us struggling against ourselves…and all it cost them was a song.